It's hard to believe we are nearing the end of week three of the scheduled 60-day legislative session, which began Jan. 8. It's been a couple of months since I last communicated with you in my email update. So let me take a few minutes to share with you the latest news from Olympia. Although we have some big issues remaining, probably the heaviest lift for the session was finally reaching agreement last week on a Hirst solution. As you know, we've been negotiating this water rights issue for more than a year, following the state Supreme Court's ruling in Whatcom County vs. Hirst, Futurewise, et al. decision in October 2016. The ruling put on indefinite hold the ability for many rural private property owners to drill a well on their properties. Most of them can now move forward following passage of Senate Bill 6091. It grandfathers existing wells as a legally adequate water supply to obtain a building permit throughout the state. It allows the counties to rely on the Department of Ecology to manage the water without the county doing an independent analysis of water availability before issuing building permits. It implements two new planning processes in certain areas of the state that did not exist before, including restrictions on water usage for domestic purposes. It provides for up to $300 million for projects in restricted areas to address stream-flow issues. Unfortunately, we were not able to negotiate changes into the Skagit River Basin, which was under a previous court order from a 2013 lawsuit by the Swinomish Tribe challenging Skagit River minimum instream flow rules. However, the compromise agreement does allow for wells and protection of instream flows for fish. In the Snohomish River watershed, along with seven other major watershed areas in Western Washington, there will be a limit for new wells to a maximum annual average of 950 gallons per day. There is also a new state fee of $500 ($350 to the Department of Ecology and $150 to the permitting authority) at the time of a building permit. While I do not agree with the new and higher fees, it was one of the compromises of the bill to allow this legislation to move forward so property owners no longer have their hands tied. In the end, I supported this bill because it will allow most property owners to develop and it provides a balanced process that also protects our watersheds. I'm very pleased to report that once a Hirst agreement was reached, lawmakers in both the House and Senate passed a $4 billion capital budget. Also known as the “construction budget,” it pays for schools, colleges and universities, prisons, juvenile rehabilitation facilities, parks, housing for low-income residents and veterans, and other facilities and programs. $46,000 for the Arlington Pocket Park Downtown Business District. This money will provide jobs and improvements to our local communities. I was pleased to vote for it. It didn't take long — just 24 hours after the Legislature convened the 2018 session — before Gov. Jay Inslee proposed an enormous tax on energy during his State of the State address. If this is truly not about state government trying to get more of your money — and if Washington is sincere about a cleaner, greener environment, leaders in Olympia should consider policies that would reduce the over-abundance of fuels in our forests that have contributed to horrific wildfires and massive amounts of carbon output when they burn. 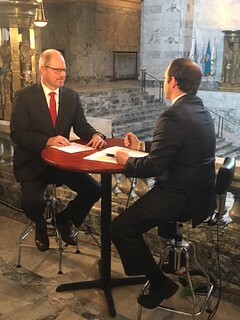 Rep. Dan Kristiansen is interviewed on TVW's “The Impact” in the Capitol rotunda on the first day of session. This is a short session and deadlines on public hearings, floor sessions and voting on bills are rapidly approaching. There's a saying in Olympia: “Silence is agreement.” I need to hear from you to know how you feel about legislation we are voting on. Please don't be silent, especially on those bills that may impact you. My contact information is below. Please call, write or email me. Thank you for allowing me to serve and represent you.